Lucindaville: Why I Live At The P.O. In this Fall's ongoing beautification of downtown Shirley, we painted the Post Office. Like many small towns, the P.O. 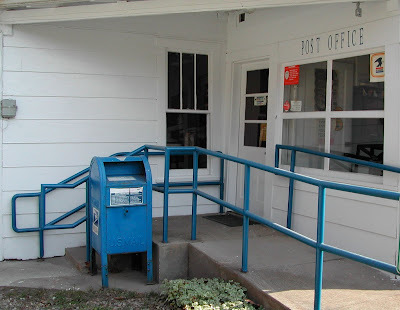 is more than just a place to get mail, it is a gathering place, an information center, and a repository of history. While I don't "live" at the P. O., I do work in the attached old general store. One day, I might actually move to town and live at the P. O. Until I do, you might want to read Miss Eudora Welty's classic, "Why I Live At The P.O." What a delight, to be reminded of this tale again. I, too, heard a recording of Eudora Welty reading it. I love, love, love that story.